Japan is a country where almost 70% of the land is covered with mountains. Since ancient times, it is believed a supreme being resides in the mountains. Gyonindo is a Buddhist concept, practiced in sacred mountains to conduct oneself in a very rigorous and disciplined way to become one with Daigongen (Great Divine Appearance) aiming to develop and master a super-natural power. Once attained, its ultimate purpose is to help and serve others. Mount Yudono is considered as the key site of the three sacred mountains of Dewa because it enshrines the most sacred, miraculous natural-wonder of Gohozen (Divine Treasure Front). Since ancient times, it has been strictly prohibited to discuss or even ask about what was seen in Mount Yudono. The Dainichibou Temple, located at the base of Mount Yudono, has a very long history. 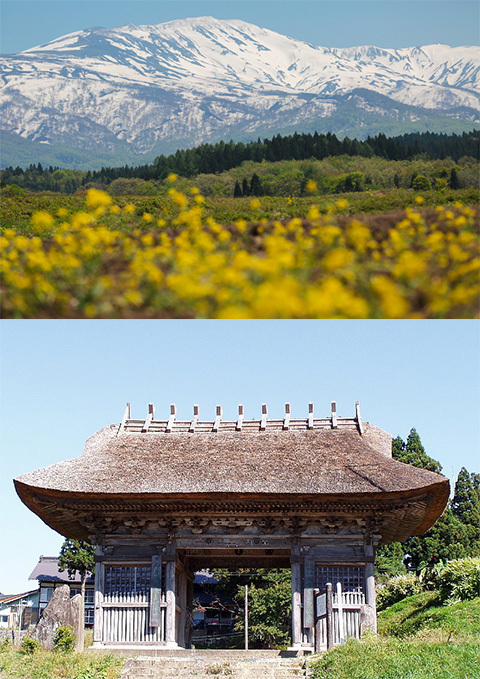 In ancient times, women were prohibited to practice Gyonindo or even to enter Mount Yudono, thus the Dainichibou Temple served as a unique temple for women. Dainichibou is also known as the site where Kasuga-No-Tsubone of Tokugawa shogunate, came from Edo (now Tokyo) to give a fervent prayer for the health and happiness of Takechiyo, the heirs to the famous Tokuygawa shogunate. In the beginning of Meiji era (1870s), the Dainichibou temple was severely damaged due to the Meiji government’s strict policies which intended to eliminate Buddhist temples in favor of Shintoism. The majority of the temple was burned and the priest’s life was taken away unmercifully. Despite these hardships, the Dainichibou Temple endures as one of the most famous temples in northeast Japan and receives many visitors throughout the year. At the Dainichibou Temple, you will meet Shinnyokai-shonin, one of the most famous Sokushinbutsu (mummified monk). Shinnyokai-shonin was born in the 18th century in Asahi village, in the Ecchu mountains. Ever since when he was a little boy, he was deeply impressed by the teachings of Buddhism. He entered a Buddhist priesthood at a young age and subsequently dedicated the rest of his life to help and save people. In order to become Sokushinbutsu, one has to reduce his fat and liquid in his body to the extreme, basically to be mere flesh and bones, thus the monks has to go through utterly severe practice, Shinnyokai-shonin was no exception, he ate nothing but several nuts a day, entered into ice-cold winter river for many hours, drank laquer sap to prevent spoiling when he becomes mummy, took his eye off when he heard that there was an eye disease spreading in villeage, Meditating in mount Yudono for many days and years, etc. 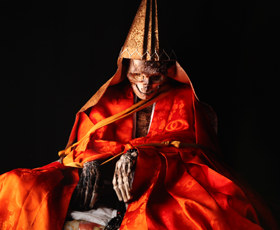 He spent for more than 70 years of his life to become a perfect Sokushinbutsu. In 1783, as he knew that the end of his physical body is approaching, at aged 96, he told his disciples that he will be buried alive deep into the soil, using a bamboo to secure minimum air, in his feeble body condition he could only pray in silent, holds a bell in his hand to communicate outer world that he is still alive, and when that bell of reply stops, that meant he became an enlightened mummified monk. On that very day, his disciples clogged the bamboo hole to prevent form entering air or water, and after 3 years and 3 months, Shinnyokai-shonin was excavated from the earth and had become such a perfet and beautiful Sokushinbutsu (mummified monk). In this absolutely astonishing way Shinnyokai-shonin demonstrate us in today’s world, the most purest form of altruism and love that is the far attainable for a mankind. When you visit our temple and to actually meet with Shinnyokai-shonin, please talk to him in silence in the hall, you will feel his love and time and space fades away between you, and it shall be truly an unforgettable and life-changing experience. We are looking forward for your visit. We change his clothes at every 6 years and the pieces are sold as amulets. 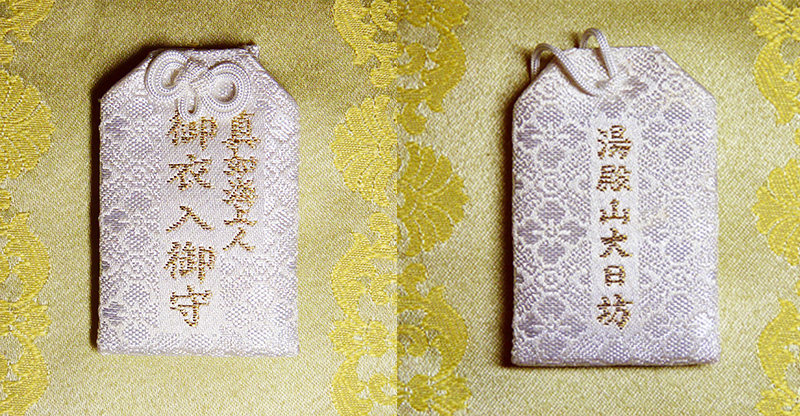 This amulet is knows as an miraculous amulet that we receive many letters of gratitude stating such as he hanged an amulet in his car and had saved from Tsunami, or succeeded a very difficult surgery, etc.